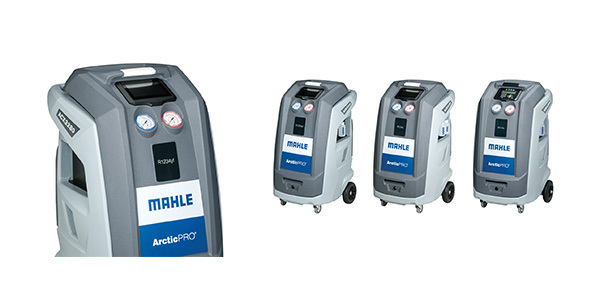 The next generation of ArcticPRO A/C refrigerant handling systems from MAHLE Service Solutions are now available for sale. The six newly designed machines were introduced to the industry at AAPEX 2018. Two units (ACX2280 and ACX2250) are available to service vehicles that are factory filled with the new R1234yf refrigerant. Four units (ACX2180, ACX2180H, ACX2150 and ACX2120H) are available to recover, recycle and recharge vehicles equipped with R134a refrigerant. The high-performance units are smaller in size than previous models taking up less space in automotive repair shops without compromising performance. One of the most popular features is an ergonomic, hinged cabinet service door for easy access to all internal component. The cabinet door is gas strut assisted and can be opened single-handedly for simple unit maintenance. Five of the six new models feature a large 7-inch capacitive LCD touch screen and a state-of-the-art, intuitive user interface, so technicians can navigate menus with ease. All units feature fully automatic operation, allowing them to run virtually unattended so technicians have extra time to perform other duties. A bright, easily visible LED indicator light at the top of the unit comes on during use to indicate machine status and when the vehicle service has been completed. 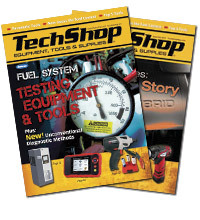 A convenient phone app, supporting IOS and Android devices, allows technicians to remotely mirror A/C service sessions and other advanced functions like push notifications. The added benefit of Wi-Fi capability ensures that the software on each unit is up-to-date with all the latest functional software and feature enhancements available. A remote technician screen control feature allows MAHLE’s technical support team access to a unit over Wi-Fi for advanced troubleshooting and support. A refrigerant identifier to ensure that the proper refrigerant is being serviced is integrated on the ACX2280, while an internal identifier with a separate sample hose is available on the ACX2250 eliminating the risk of internal contamination of the unit. Both units service R1234yf vehicles. Several models have an oil system management function to provide automatic weighing of recovered and injected oil, allowing accurate replenishment of oil removed during service. Built in network printing from the unit interface can generate full-page service reports or emailed reports for customers. Optionally, built in thermal printers are also available. MAHLE provides an industry leading two-year warranty, which includes a full one-year warranty and a second year for parts only. Every unit is easy to maintain either by the owner, through MAHLE’s, nationwide service centers or with phone/Wi-Fi technical support coverage.